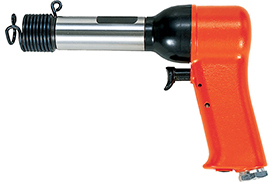 Fuji light hammers provide a controllable impact for riveting to reduce the effect of work hardening of the rivet or damage to the surrounding metal. These tools are easily adapted to perform other operations, such as cutting, ripping, shearing, punching and gouging with suitable chisels fitted. The Fuji light hammer locking handle is designed to reduce the risk of accidental starting of the tools. The handle is automatically locked when the operator releases the handle. The 5412053390 Fuji Light Hammer is one of thousands of quality tooling products available from MRO Tools. Please browse Fuji Light Hammers for tools similar to the 5412053390 Fuji Light Hammer. 5412053390 Fuji Light Hammer description summary: Fuji light hammer. Model: FRH-6-2 NPT Chisel Shank: Chisels (Round Shank) Riveting Capacity (mm): 0.25 Duralmin/0.19 Steel Blows: 30Hz Piston Diameter: 12.7mm/0.5'' Stroke: 100mm/3.94'' Overall Length: 206mm/8.11'' Quantity discounts may be available for the 5412053390 Fuji Light Hammer. Please contact MRO Tools for details.